In the early 1970s the Cubs had a utility infielder by the name of Carmen Fanzone. 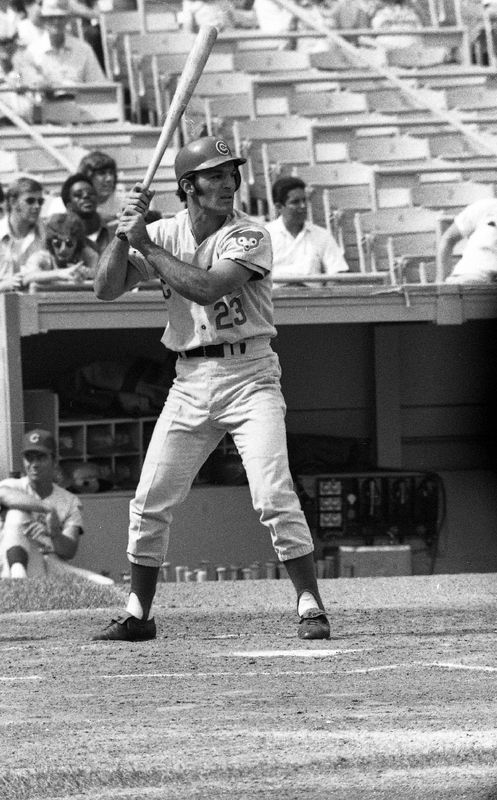 Fanzone bounced around the Red Sox farm system for several years before making the big league club in 1970 but he was traded to the Cubs prior to the 1971 season. Plagued by injuries Fanzone never realized the potential he showed as a young player coming out of Detroit in the early 1960s and he was out of baseball by 1974. The interesting thing about Fanzone was his off-season avocation: professional trumpet player. Fanzone played in Jazz clubs in Chicago, gave lessons and at one point was even a member of the Tonight Show orchestra. On road trips with the Cubs, while most of the other players were out on the town, Fanzone would be holed up in his room playing scales on his trumpet. When I think about Carmen Fanzone I think about some of the other uniquely well-rounded and talented ballplayers of his era including Curt Flood, an accomplished painter or Denny McClain, an organist who was good enough to record two albums with Capitol Records. Reggie Smith, an all-star outfielder with a host of teams, was proficient on several instruments including, the cello, violin, clarinet and saxophone. On the road with the Red Sox or Cardinals, Smith would often forgo the bars for the art galleries. Steve Stone was a state–wide championship bowler and ping-pong player. And the list goes on and on…. Well-rounded ballplayers like Fanzone just don’t exist anymore for the simple reason that society nowadays attaches value to and amply rewards rigid specialization. Athletes are not immune and it is rare now to hear of a professional baseball player who can do anything well but play baseball. We seldom learn interesting details about a player – simply because there are none to tell. We have only statistics. It was a better game when Carmen Fanzone played.